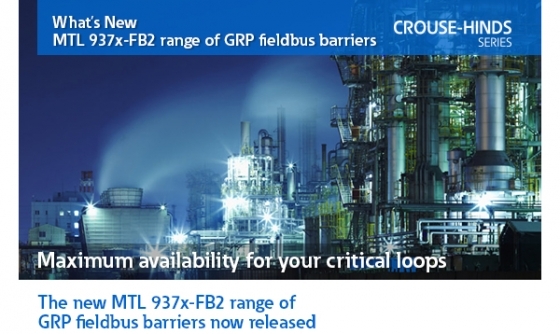 Eaton is proud to announce the launch of the new 937x-FB2 range of MTL GRP fieldbus barriers, part of the Crouse-Hinds series portfolio. Fieldbus barriers have become an established means of providing connections to intrinsically safe field instruments in FOUNDATION™ fieldbus networks in Zone 1 or Zone 2 hazardous areas. Our existing range of fieldbus barriers have already set a new standard for flexibility, safety and ease of use, compared with previous generations of products. With over 40 years of experience in harsh, hazardous and industrial environments and a global network of sales and support, you can rely on Eaton as a trusted supplier for all your process connection needs. © Eaton 2015, All Rights Reserved. Privileged information and/or copyright material may be contained in this e-mail. If you are not the intended addressee you may not copy or deliver it to anyone else or use it in any unauthorised manner. To do so is prohibited and may be unlawful. If you have received this e-mail by mistake, please advise the sender immediately by return e-mail and delete all copies. Thank you. If you no longer wish to receive any emails from us, please click here to easily remove yourself from our mailing lists.